B68 turning around in the Mermaid Bus Loop in Brooklyn. Resized photo courtesy of Eye On Transit. Some day, that bus you’re riding will end up in a windy, sprawling asphalt lot along a marsh in the Bronx, the place where NYC Transit buses come to die. 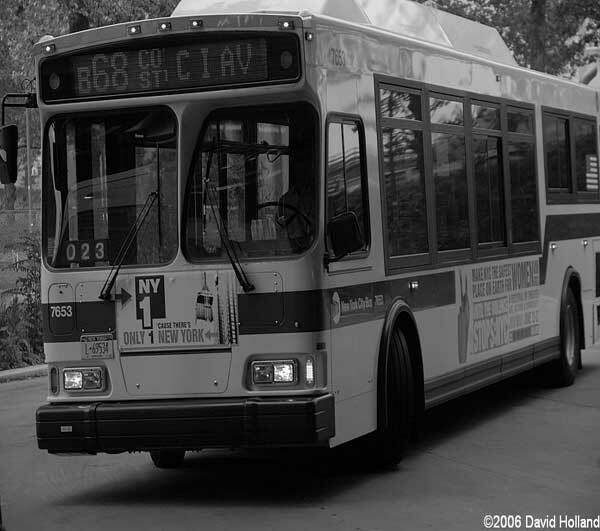 Under a new program, buses that have traveled, on average, more than 400,000 bumpy miles on city streets are sent to the MTA’s Eastchester Bus Depot, a 27-acre site in an industrial pocket near the New England Thruway. The rigs’ final hours are far from peaceful. “Basically, they bring them here and we tear them apart,” mechanic Sham Seonarain, 34, said with a bit of glee in his voice Thursday. The buses either limp into the depot or are towed in, where teams of mechanics ravage each one in power-tool blitzes lasting 30 hours apiece. The deconstruction experts salvage up to 80 different parts to be reused – everything from rear-view mirrors to windows to 1,500-pound transmissions. Before the program was launched in August, a bus completing its last passenger run would be parked at one of the Metropolitan Transportation Authority’s 29 depots. There, some parts might be removed by the depot’s mechanics before the bus was sold as scrap.